Many have praised the All-New, All-Different X-Men—the series that started with GIANT-SIZE X-MEN #1—as a breakthrough in superhero comics. I've posted some of the plaudits at X-Men Hits the Spot and I agree with them. The series was a landmark in many ways, not the least of which was its international, multiracial, multicultural cast. People point to this series as if to say, "See? Comics are multicultural!" But a multicultural breakthrough isn't the same as multicultural perfection. The changes Len Wein, Dave Cockrum, and especially Chris Claremont instigated were fundamental and far-reaching in one sense, but superficial and stereotypical in another. The ongoing team of Cyclops, Marvel Girl, Banshee, Storm, Colossus, Wolverine, and Nightcrawler had six Caucasians and five Anglo-Saxons. Make it seven and six if you count Professor X. That's hardly what I'd call multicultural perfection. Even Storm was an American citizen abandoned in Africa. So a full eight of eight characters came from a European or European-derived culture. And the next two characters to join, Kitty Pryde and Rogue, only cemented the trend. If anyone wants to argue Storm is African, don't bother. With her exotic features, she's barely black, much less African. Other than her generic goddess beliefs, she doesn't have a trace of African culture about her. The revamped X-Men were a step in the right direction. They weren't the sine qua non of multiculturalism by any means. In his 20-plus years writing the X-Men, it would be fair to say Chris Claremont revolutionized superhero comics. He gave us cosmic epics...developed strong female characters...tied mutant prejudice to anti-Semitism and homophobia...explored Japanese and East Asian cultures in-depth...and introduced characters from around the world. Of particular interest are his Native American characters: Dani Moonstar, Forge, and James Proudstar (Thunderbird/Warpath). Yet for all he's done, his characterizations often seem sharp and striking rather than deep and varied. A common complain is that he writes one strong woman, not many. 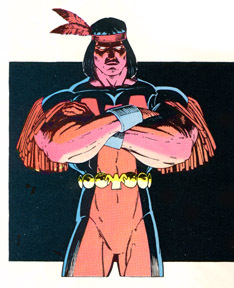 His take on the Native American Wyatt Wingfoot in 2000 was almost as superficial and stereotypical as his take on Thunderbird in the 1970s. In 2001, Claremont and Marvel launched yet another new X-book, X-TREME X-MEN. Proving my point that he doesn't quite "get" multiculturalism, Claremont made an astounding statement in an interview published in #1. He said, "This is also the first mainstream super hero group whose membership is predominantly third world." The team of Storm, Beast, Rogue, Psylocke, Thunderbird, Bishop, and Sage (Tessa)..."predominantly third world"? Wrong as wrong can be, Chris. Permit me to show you the error of your ways. Let's stipulate a couple of points. First, let's assume the Beast (Hank McCoy) is Caucasian. I've argued that anyone who changes shape the way the Beast has loses his racial characteristics, but clearly he was Caucasian, if he isn't now. Second, my impression is that Sage is from Great Britain, though she could be from the US or some other Western country and it wouldn't change the analysis. Let's assume she's British for the sake of argument. Claremont's "third world" phrase alone suggests that he's out of touch. The phrase "Third World country" lost currency about the time Communism fell in the '90s. Since the "First World" was the West and the "Second World" was the Soviet Union and Eastern bloc, these references to "worlds" no longer have much meaning. Third World countries usually are called developing countries today. When "third world" was current, it referred to a region's socioeconomic status, not its ethnic makeup. Caucasians lived and still live in Third World countries—in Africa, Latin America, and elsewhere. Likewise, blacks, Latinos, Asians, and other "ethnic" groups aren't limited to the countries formerly known as Third World. For those not familiar with Betsy "Psylocke" Braddock, she was born and raised an Anglo-Saxon but now inhabits a Japanese body. Japan is a First World, not a Third World, country. Whether you go by her mind or her body, she's a First Worlder all the way. So the X-Treme X-Men are predominantly Anglo-American by place of birth, predominantly Anglo-American by cultural upbringing, and predominantly "first world" by Claremont's "third world" criteria. The team is "only" predominantly non-white by standard (but arbitrary) racial criteria. If that's what Claremont meant, he should've said so. With Storm a faux African and Thunderbird a member of India's upper-crust elite, the team barely qualifies as multicultural. 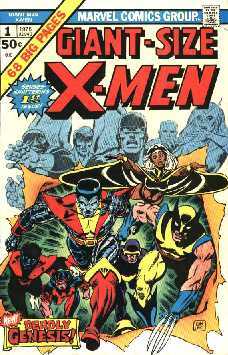 Of course, the X-Treme X-Men isn't the first predominantly non-white superhero team by a longshot. If that was what Claremont meant, he was wrong there too. No matter what he meant, he was wrong. Perhaps Chris is getting forgetful, because his X-Men have spun off at least two teams more diverse than his X-Treme X-Men. The original New Mutants were 60% non-white (Mirage, Sunspot, and Karma vs. Cannonball and Wolfsbane). The original Generation X was 80% non-white (Jubilee, M, Synch, and Skin vs. Husk). Compare these teams to Claremont's present team, which is "only" 57% (4/7) non-white. If you count Appalachian Kentucky and fundamentalist Scotland as multicultural locales, the background of the original New Mutants and Generation X was 100% multicultural. By the same definition, the X-Treme X-Men reach only 43% (3/7). Any way you look at it, the Beast, Rogue, Psylocke, and Sage (from what we know of her) grew up in the plain-vanilla United States or Great Britain. Even Claremont's 1975 X-Men were only half American or British by birth, or 3/4 if you count Canada and Ireland as part of the British Empire (see above). His 2001 X-Treme X-Men are 6/7 American or British by birth. Thunderbird, the one exception, comes from a country heavily influenced by British culture. The epitome of progress this isn't. To be sure, there's nothing particularly bad about the X-Treme X-Men. It's your typical "multicultural" team that really reflects the writer's Euro-American mentality. But it isn't a "first" anything—unless you count Claremont's claim that it's the first team to have two black leaders. I wouldn't bet on that one, either. What about DC's Suicide Squad, with Amanda Waller the commander and the Bronze Tiger a team leader? I suspect there are other examples. Oh, well. Better luck next time you create a multicultural team, Chris. Don't make unsupportable claims just to hype your latest series, okay? This year a Marvel comic revealed that Bishop's grandfather is the aborigine Gateway. As far as we know, that makes Bishop 3/4 black and 1/4 quarter aborigine. I don't think that was Chris Claremont's doing, but it's troubling as a multicultural development. Someone may believe aborigines are black Australians, which isn't the case. There's no connection between aborigines and Negroes except their coincidentally dark skin. To imply they have some common bond or heritage is a gross, stereotypical mistake. "I remember a time when X-Force had 3 Latinos at one time, if you count the Brazilian Sunspot, plus Warpath." "[L]iked seeing the comic being put into the perspective of time, culture and human failing...."